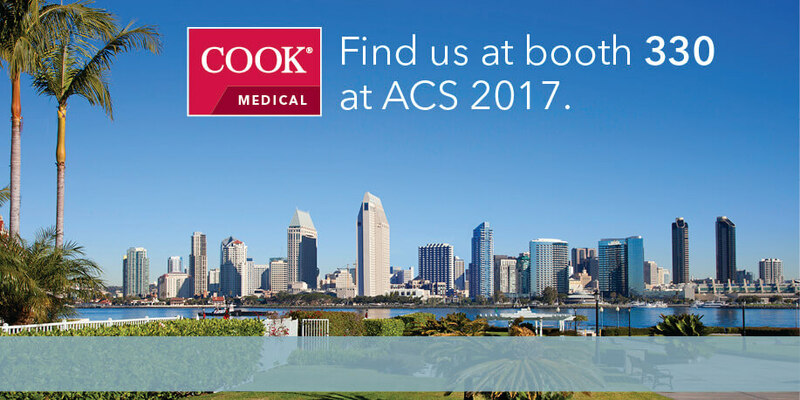 The annual American College of Surgeons (ACS) Clinical Congress is in San Diego this year from October 22-25. Stop by the Cook Medical booth in the expo hall to see us. What will be at the Cook Medical booth this year? Stop by the booth to see our products for cholangiography, common bile duct exploration, and endobiliary stenting. You can try out these products with our bile-duct models at the booth too. What are we excited to see at ACS 2017? The theme of this year’s congress is “Do what’s right for the patient.” Since Cook Medical has always been devoted to putting patients first, this theme makes us particularly excited. Here are some of the other topics we’re looking forward to. Lap chole and common bile duct exploration: On Monday, a panel will discuss complex cholecystectomy and the management of bile duct diseases. Ventral hernia repair: On Monday and Tuesday, panels and lectures will discuss procedures and techniques for ventral hernia repair. These procedures can be supported by our products like the Biodesign® Hernia Graft and the Novapass® Suture Passer. Reconstructive technology: Another panel on Monday will discuss 3D-printed scaffolds and other emerging technologies that can help reconstruct the body. Follow us on Twitter for updates from #ACSCC17.